I am currently collaborating with Jennifer Stock on Invisible Seams, a new augmented reality walking tour of SoHo, NYC centered on the globalization of the fashion industry. As participants walk the streets of SoHo listening to a podcast that guides them through the neighborhood, they will peer behind the spectacle of fashion advertising to discover who really makes their clothes, how they are made, and how all of us can take part in transforming fashion to be a sustainable force for good. 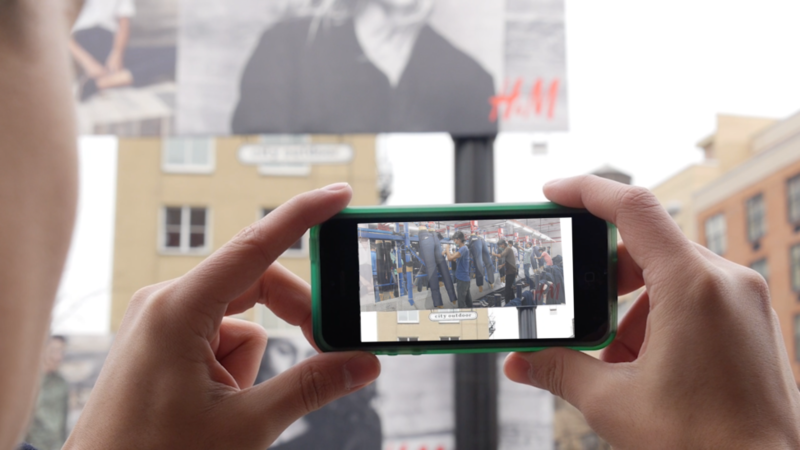 Invisible Seams uses smartphone technology to superimpose images of workers and garment factories directly onto store windows of global fashion brands in SoHo. For example, an H&M logo will trigger footage of a garment worker sewing in Sri Lanka, superimposed on the H&M storefront, speaking directly to the participant about making clothes for Western brands. As a past garment manufacturing center and the birthplace of the American labor movement, SoHo is the perfect place to explore the pleasures and perils of shopping, such as the history of American apparel manufacturing, the outsourcing of clothing production, the rise of fast fashion, and the attendant labor and environmental problems of globalized manufacturing. Today, 10% of all carbon emissions come from the apparel industry and 98% of garment workers receive less than a living wage. Our project will reveal the larger ramifications of our everyday purchases on the environment and people’s lives in the developing world. In order to connect American consumers directly to the people who make their clothes, we traveled to Bangalore and Colombo to interview garment workers to that we can include their voices in Invisible Seams. We met with garment workers in their boarding houses near the Export Processing Zone in Colombo with a Singhalese translator to hear their important perspectives. We also spoke with factory owners, sustainability managers, and activists. This material provides a framework for examining the broader consequences of globalization and its relation to climate change, uneven economic growth, and human rights violations.